SEO impact: make sure you website is mobile friendly! The official Google Webmaster Central blog tells us that mobile-friendliness it going to be a ranking signal, very soon! Have you checked if your site is mobile friendly? 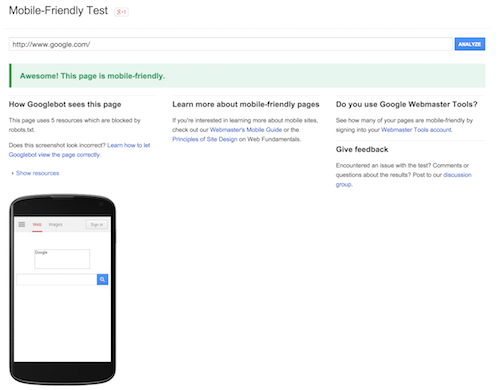 You can easily check and see if Google considers your site mobile friendly. Use this Google tool to check . You can also run a check with the W3C Mobile OK validator. This is a different test and will check a lot more things that the Google check does. If your sites passes the Google Mobile Friendly test, it might fail the W3C Mobile OK validation. Besides doing on-page optimization of your content, with which #webtexttool can help you of course, make sure mobile friendliness is also taken care of! Want to make sure that your content is optimized the right way? It wouldn’t hurt to check your content after this update. Click here to check your content with our free trial account.